In recent years, rapidly increasing construction costs have create many cases that exceed budgets in various phases of construction projects, making it difficult to continue with these projects. At Meiho Facility Works, we provide cost management services that make use of our proprietary database, which is built upon the roughly 2,000 construction order-placement support projects we carry out on average every year. In addition, our in-house "cost monitoring team" members keep constant watch on fluctuating prices resulting from changes in the balance of construction-related market demand and, by taking advantage of this knowledge of market changes and actual prices, provide support for customers' projects. 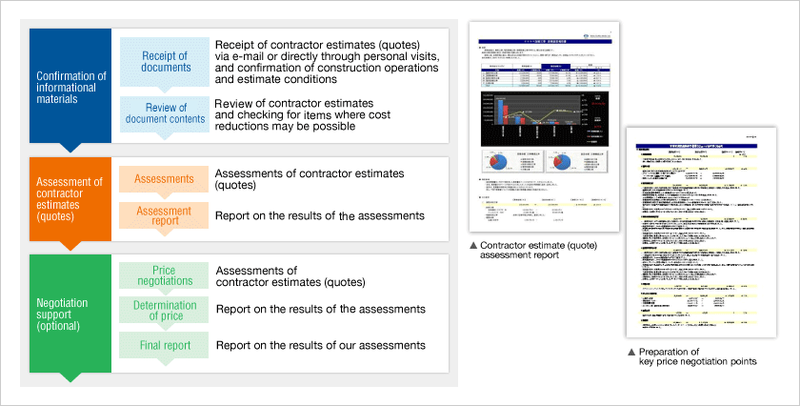 It is becoming increasingly common for construction cost estimates (quotes) to greatly exceed project budgets as formulated during the planning stages. Meiho Facility Works manages costs during every phase of the project, from planning through to completion of construction. We make all processes more transparent and provide support to help customers finish projects without exceed their original budgets. We review designs, rough cost estimates during design from a neutral, third-party standpoint in pursuit of cost reductions. 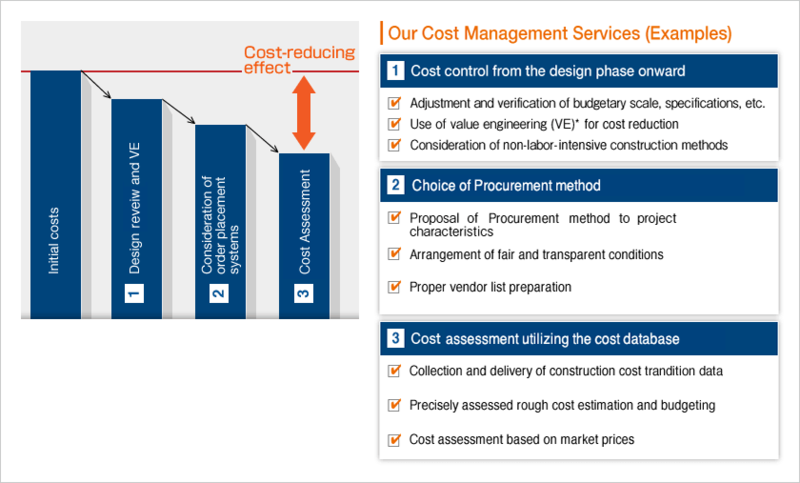 Our engineers, who have a wealth of experience in design and execution, utilize a VE* approach, various measures in the procurement stage, cost assessments of contractor estimates and provide a range of services to each customer to maintain required functions with cost reduction. 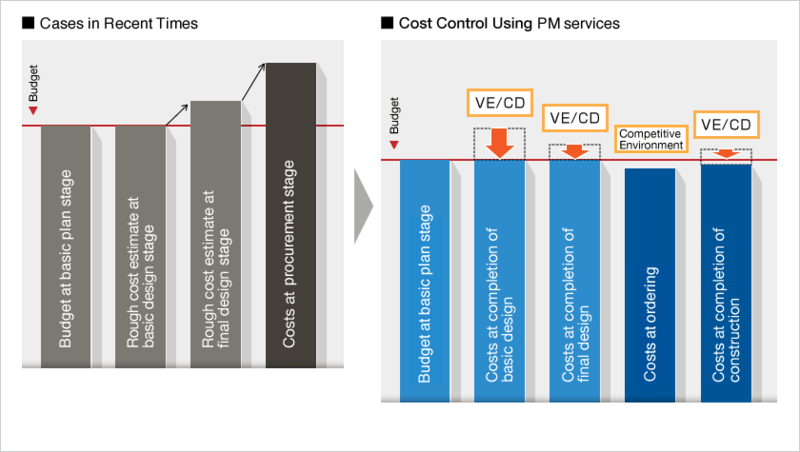 * Value engineering (VE): an approach that clarifies the relationship between value of actualization and required costs in order to provide multiple low-cost options that lower costs without detracting in terms of value. We perform each item cost assessment of contractor's estimate utilizing our cost database updated with current market prices and we quickly provide reports summarizing assessment results and, if the customer so desires, offer our support during price negotiations. Utilizing assessments from our company-serving as a completely neutral party-allows cost reduction, appropriate construction costs and accountability to stakeholders.